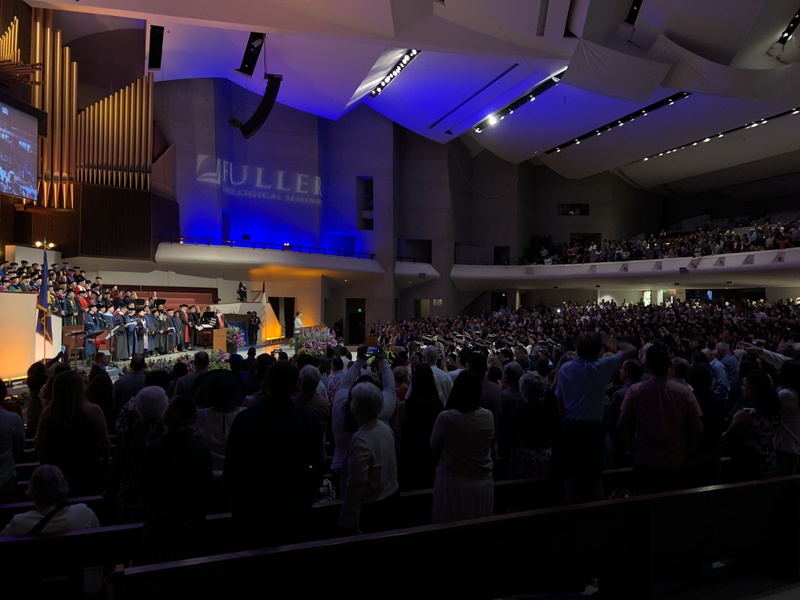 The main sanctuary of Lake Avenue Church was filled to capacity with celebration on June 9 as students, staff, faculty, family, and friends gathered for Fuller’s 69th Commencement ceremony. Ed Willmington, composer-in-residence and director of the Fred Bock Institute of Music at Fuller, conducted the organ and brass ensemble that ushered in the graduating students and faculty. Fuller chapel leaders September Penn, Brianna Kinsman, and Angie Paek led the congregation and worship team in praise for God’s faithfulness in the lives of the graduates. The Commencement ceremony also featured three student speakers representing each of Fuller’s three schools—Linda Barkman (School of Intercultural Studies), Sheila Muchemi (School of Psychology), and Jon Ball (School of Theology)—who described their experience at Fuller and their growing sense of calling, each to resounding applause. The graduation ceremony celebrated 684 students from Fuller’s three schools—a graduating class that represents 14 degree programs and 42 countries. Fuller is proud of its graduates and their work as they continue, renew, and begin in service as global leaders in kingdom vocations. Congratulations, class of 2018!